2projects4all - Collaborate in the translation of the texts. Collaborate in the translation of texts. In translations, one does not necessarily have to be mother tongue, although there will be imperfections, all together we will improve the comprehension of the writings. For the Spanish language, we will have to review the nonsense that I could have written; in any case, it will be very helpful to have established most of the work. As you all know, Google Translate translates sentences mechanically, so we will have to make them more human by translating them into the common way of speaking. For the English, I would like to continue with the traditional one, avoiding inserting particular sleng unless they refer to any of my characteristic phrases that then must be translated with that method. As already mentioned, since this is a project open to all the nations of the world, there is no limit to the number of languages we can enter, everyone has the right to visit and read translated texts in their own languages, then, any language you know how to translate, do below. All together to make our life more understandable. This, provides that everyone has the opportunity to share their ideas about the 2projects4all project, so if they wish, they will create pages where they can convey a message that goes beyond the normal way of expressing themselves, as always, everything will have to be written with the heart. Do not send the classic 4 cross lines that do not know anything. Learn again to write by sending a page where they express their broad thinking, reasoning and suggestions on everything we need to expand and consolidate the 2projects4all project. All this not only means to make people understand that they have to change their mentality, but it is also useful to convey feelings and love for everything that surrounds us. Over time we have lost our innate quality of making our neighbor feel our human warmth, but if a lively mature like me succeeds, anyone can have the same success! So writing about all this and later about the products and companies that we want to create cannot do more than good. As an Industrial Consultant, I have always tried to teach entrepreneurs that human contact is a key part of the customer loyalty process. Even when explaining the fateful question: "Would you ever leave your family?" They never understood the meaning of this important commercial peg. The client, when he feels at home and in the family, will always be well inclined to remain with you, appreciating you, defending you and above all increasing the commercial success of your products, becoming the guarantor of the publicized quality. This is the reason why the client should never be betrayed, mistreated, cheated and especially cheated. If you make an item pay dearly, at least give it a magnificent 360° service! But with facts and not just words! We do not complain then if companies close later due to lack of customers. For them, the main objective is always and only earns money, there is nothing else. In 30 years I have managed to make this method learn to few clients, but I can guarantee that these are the years that these companies are thriving, have solidity and an enviable customer base. Apart from the remuneration, the most rewarding thing is to see, when I visit, how they treat employees and clients, to enter these companies is like entering the family. This is the message. 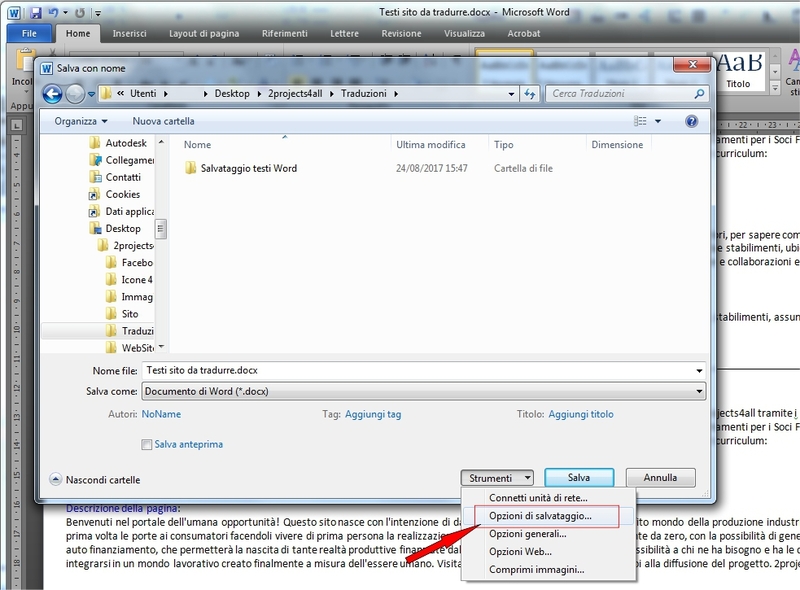 Going further, those who will offer their collaboration for the translation of the texts, will receive a compressed file with the WinRar program (you can download it directly from the manufacturer's website in 32 and 64 bits version), which will contain folders with the files of text, divided into pages and written in Word with the extension .docx. The first folder called In lines, the text is organized in lines, leaving you the possibility to write the translations under each paragraph; in the second folder, there are the pages with the text inserted and arranged in a table of two columns, to write the translation in the column on the right. In any case, use the method that best suits you. For your convenience, I can provide files in .docx, .doc, .rtf, .odt, .txt, .pdf format or in the format that best suits your writing program. Obviously, even for a faster execution of the works, it is better to use the .docx format. The scripts will be constantly updated, then when the general translation of the contents of the site is completed, only the files with the text updates will be sent immediately. Important! Always remember that to save the file permanently in Word, you must first choose "File", then "Save as" and in the window that appears, after giving the name and choosing the destination folder, you must open the "Tools" drop-down menu at the bottom left of the "Save" button, and choose the "Save Options" item. Then, you will open a window titled "Word Options" and here you have to select and value the 3 boxes in the "Preserve fidelity when sharing this document:" section. 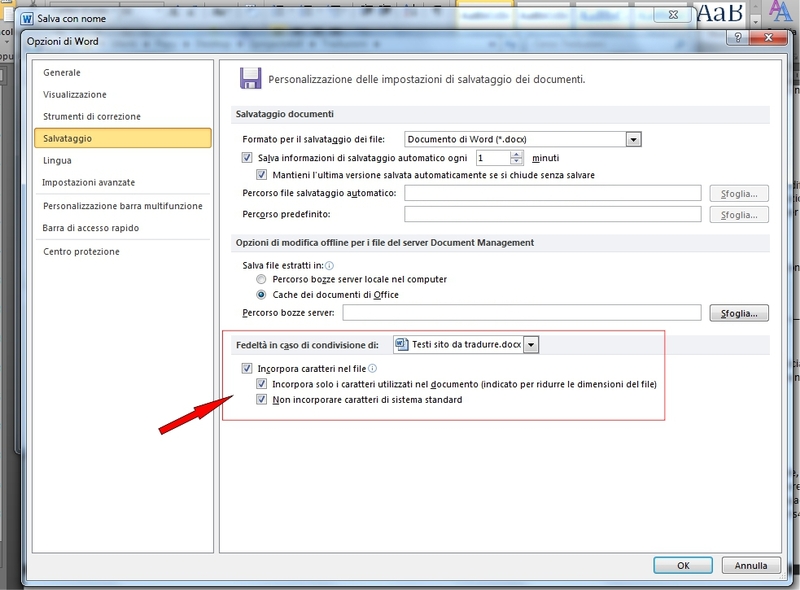 These options are very important because it allows them to integrate the characters they used, in the Word document they will send, this will avoid problems when loading the document in different computers, especially if it is configured for different languages. Alternatively, if you are an expert, you can attach the characters used to the email sent with the texts. As the compressed text files will always have small dimensions, it will not be necessary to have an FTP account, the exchange will be carried out constantly through the email indicated in the Contacts section.